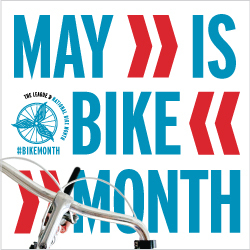 Bike Cleveland | Working For Safe Streets | May is Bike Month! Let’s Ride! May is National Bicycle Month, get outside and spend some quality time on your bike! All month: Gohio Commute Bike Month Challenge – More Details – We have partnered with NOACA and uGO to invite NE Ohioans to join a friendly Bike Month competition on Gohio Commute! Ride your bike to work and use it for errands during the month of May and take the challenge! It’s easy! Just register on Gohio Commute, log your bike commutes during May, and follow the leaderboard for up-to-the minute standings. Up to two bike commutes/errands per day will count toward your standings. Use the bike instead of the car and you’ll be eligible for weekly raffle prizes, and top bike commuters (1st, 2nd, and 3rd place) will take home the grand prizes! May 6th: Open Streets Cleveland, Detroit Avenue – More Details – Open Streets Cleveland temporarily reclaims streets as a free public space for people of all ages and abilities. With car-free neighborhood routes of 1 to 3 miles, Open Streets Cleveland builds community through safe and accessible people-powered movement. Join them as we re-imagine streets as a place for people. Come out to bike, walk, skate, dance, and play! May 7th (and con’t on Mondays): Slow Roll Cleveland – More Details – Slow Roll Cleveland is a social bike ride that calls the entire city its home. They meet up in a different place every Monday night, and then ride about ten miles and return to where they started. The ride meets up at 6:30pm and rolls out at 7pm on Monday nights and sometimes on the weekend. The speed of the ride is between 6-10 mph. This is a family friendly ride that maintains safety for all riders. May 13th: Cyclofemme – More Details – Join women around the globe, and locally here in Cleveland as we band together on bikes to celebrate collective momentum. Inspire one more woman to ride a bike, and you can change the world. May 15th: Bike Smarts/How We Roll – More Details – You’ll enjoy a casual ride through Cleveland and it’s suburbs that prepares you to safely and confidently navigate traffic by bicycle. There will be stops along the way to discuss the pertinent subjects relating to that safety and confidence. Topics include bicycle traffic law, proper lane positioning and more. May 16th: Ride of Silence – More Details – Join cyclists across Greater Cleveland for the most important ride of the year. Local cyclists will join others across the globe in a silent slow-paced ride in honor of those who have been injured or killed while riding a bicycle on our public roadways. The Ride Of Silence is a free ride that asks cyclists to ride no faster than 12 mph and remain silent during the ride. There are no brochures, no sponsors and no registration fees. May 18th: Bike to Work Day! – More Details – Celebrate National Bike to Work Day on May 18th by swinging a leg over your bike and riding it to work! Join thousands of cyclists nationwide as we take to the streets and embrace the power of getting to work under our own power. We do our best to make this day special for local riders, and we hope it stokes the fire for you to consider leaving that car at home at lot more often in the future. May 19th (AM): Pedal for Prizes – More Details – Old Brooklyn Pedal for Prizes returns for its seventh year during Cleveland Bicycle Month. Win great prizes, including brand new bicycles, simply by exploring local businesses and other points of interest in Cleveland’s Old Brooklyn neighborhood by bicycle. May 19th (PM): Wild Ride for Wildlife – More Details – The Wild Ride for Wildlife will feature a short course and a long course for cyclists of all ages to enjoy an after-hours tour of the Cleveland Metroparks Zoo by bike! And there’s more! Below you’ll find a complete listing of events and meetups for May and beyond!